Four Terex Optima TC55 aerial devices provided by Custom Truck One Source were a key tool in setting up the Hurtman Rescue competition at the International Lineman’s Rodeo. Four Terex Optima TC55 aerial devices provided by Custom Truck One Source were a key tool in setting up the Hurtman Rescue competition at the International Lineman's Rodeo, held Oct. 13, 2018, in Bonner Springs, Kan. Judges used the aerial devices to position a mannequin representing an unconscious line worker atop poles for the Hurtman Rescue event. The Optima TC55, introduced in 2017, is a 55-ft. non-overcenter aerial with up to 42.8 ft. of side reach. The purpose of the Hurtman Rescue is to demonstrate speed while safely lowering an injured worker (represented by a mannequin) who is unconscious at the top of the pole. Teams of journeymen and apprentices competed in the timed event. "We wish to extend our congratulations to the teams from Southern California Edison/IBEW Local 47 and Pacific Gas & Electric for finishing first in the Journeyman and Apprentice categories, respectively," said Casey Pratt, strategic account manager. 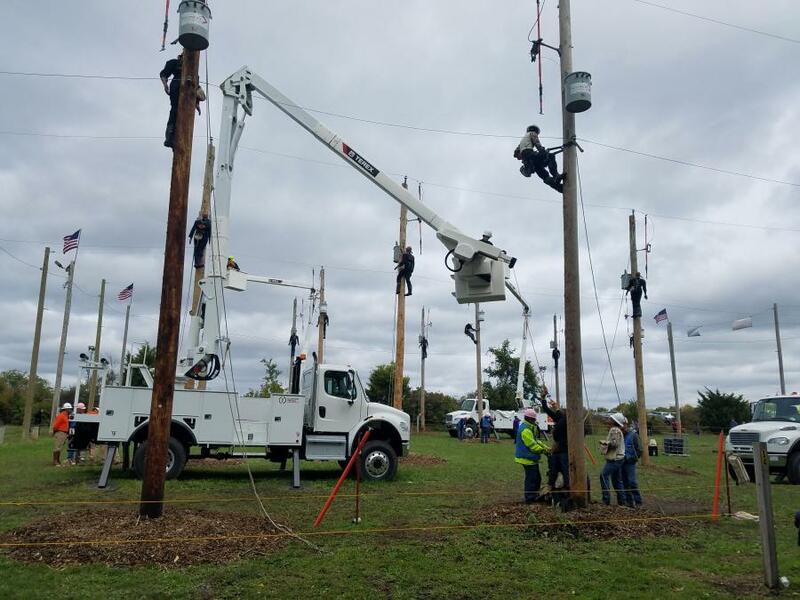 "Terex Utilities proudly supports the International Lineman's Rodeo, which attracts the best lineworkers from around the world and shines a light on the skills needed for safe, productive work in the electric utility industry." Southern California Edison's Journeyman team consisted of Wil Robinson, Jacob Lybbert and Ramon Garcia. They rescued the mannequin "lineman" in 59:74 seconds with zero deductions. The Journeyman competition simulates working in a hot line situation, while the apprentice category is a one-person event, mimicking a de-energized scenario. Gary Hoch of Pacific Gas & Electric finished in 47:72 seconds with zero deductions. For more information about Custom Truck One Source, visit www.customtruck.com.